I love this little guy, he is sooo cute. A great edger, covering up old bulb foliage and the flowers, don’t get me started on them, they are perfect. 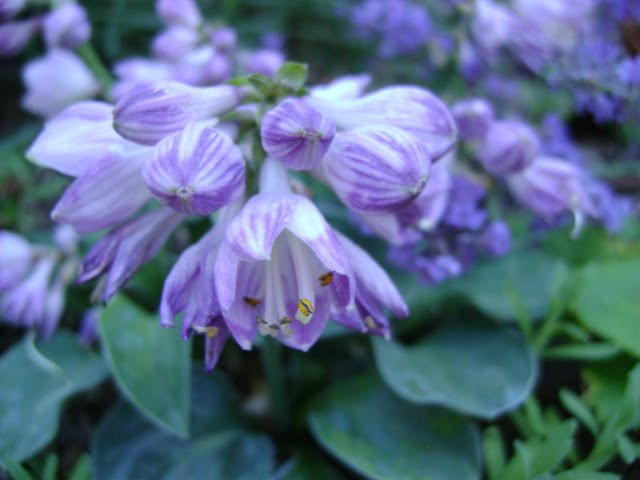 Unlike large hosta, where the flowers are spread out up the stem, these are compact and very close together, perfect for a vase as well. And are they large for the size of the plant, wow. 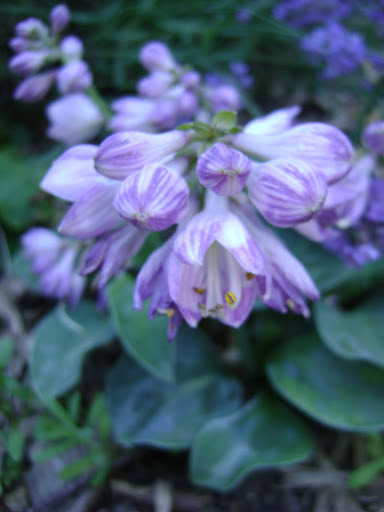 There is certainly a reason Hosta ‘Blue Mouse Ears’ was named hosta of the year in 2008. 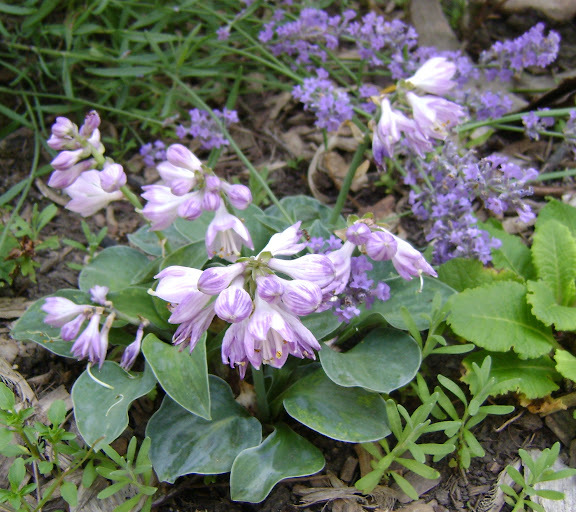 It has very thick, round and rubbery blue-green leaves, you know that means no slug holes. 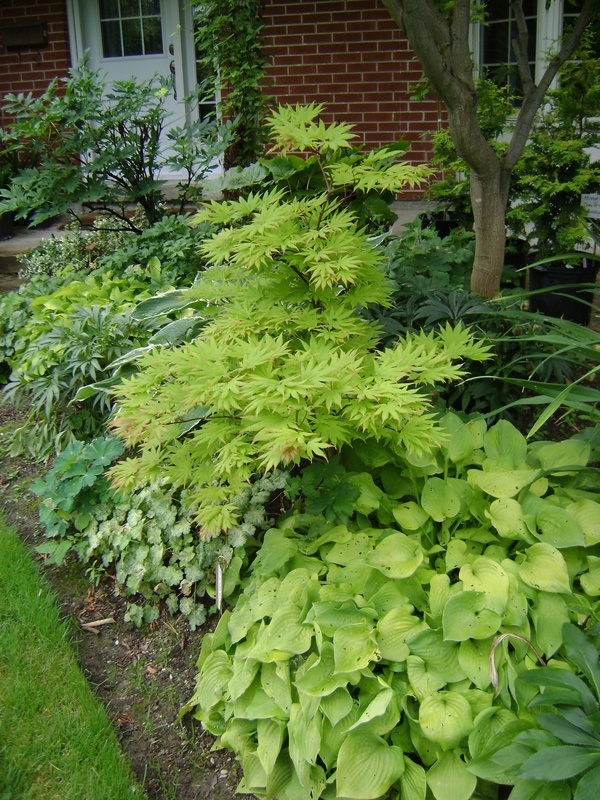 It grows only to about 8′ high and 12′ across, I planted mine under my Japanese maple, Acer palmatum ‘Waterfall’. It looks lovely (at least I think it well when it finally reaches) with the pale green cut leaves dripping down to the roundish leaves of the hosta. Carolyn had a whole post about the ‘Mouse‘ series, apparently ‘Blue’ has been a busy boy and spawned a very large family. Now if he would only get busy and get much fatter, I would love to divide him and enjoy it all over my garden. I am on a bit of a Japanese Maple kick these days. I blame Loblaws! They have always been expensive trees to buy and I never once thought about investing in one. Sure, I thought they were beautiful and I enjoyed seeing them in other people’s gardens. All photographs taken at Marion Jarvies garden, (not my own, boo hoo). Last Fathers Day, I started down that slippery slope. Loblaws had Japanese Maples for sale in two gallon pots for $20.00!!!!!!!!!! How could I resist? Obviously I couldn’t, so I bought three. 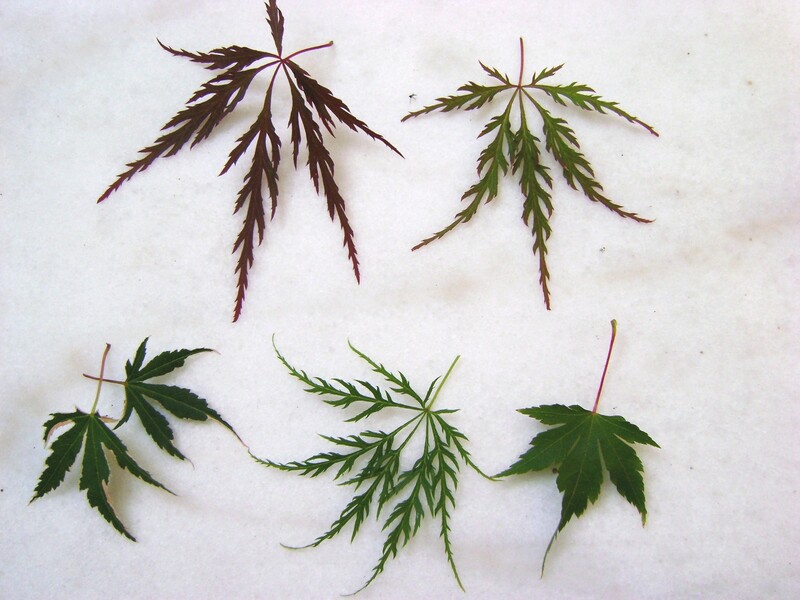 Two of them were ‘Red Dragon’ a red cutleaf variety, and the third ‘Waterfall’ has a green cut leaf. 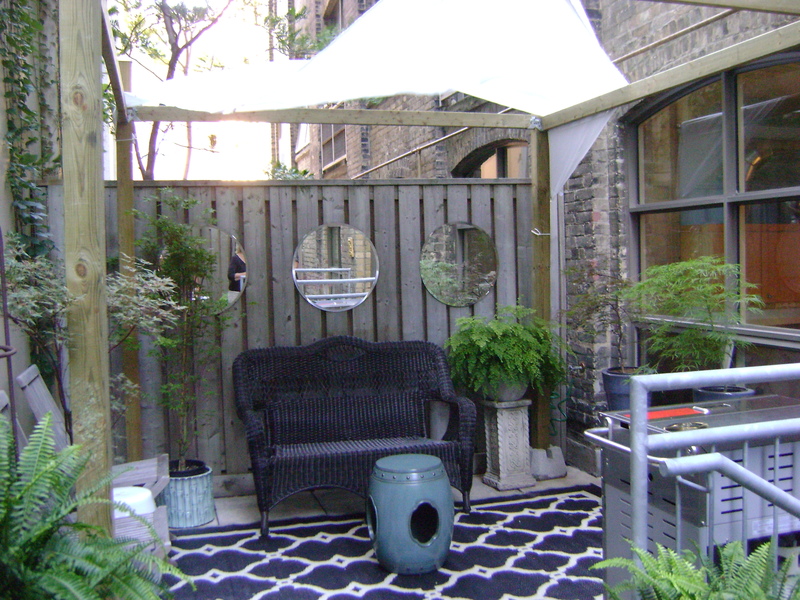 I put them in pots on my shady terrace in Toronto and enjoyed them all summer. When winter started approaching, I googled ways to look after them. 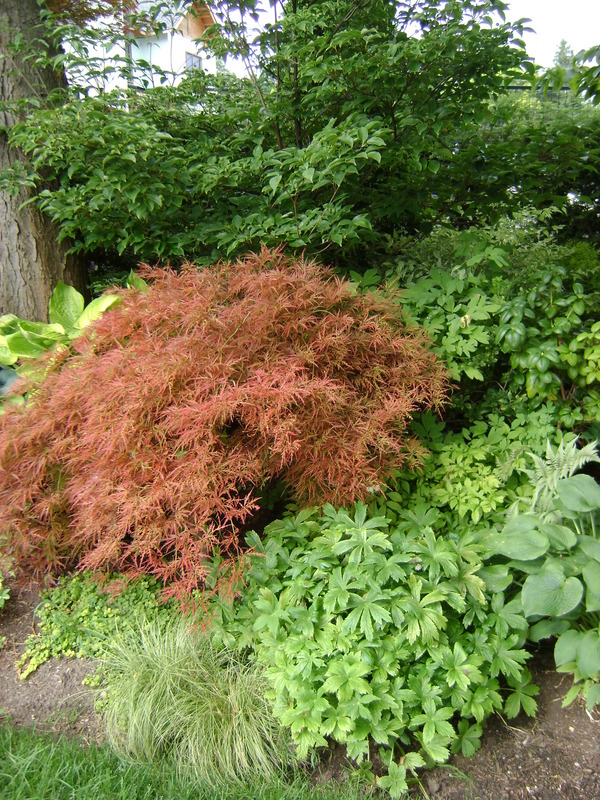 Margaret Roach one of my favourite garden bloggers, also has Japanese Maples in pots in her garden in upstate New York. She moves them (with a hand truck or dolly) to her barn, where they stay all winter. I do not have a barn, but I do have a garage, so I thought about this. But when I was living in Kingston, I used to just bury the plastic growers pot of my ‘Bloodgood’ in the garden. It lived a number of years this way, and when I moved to England, I gave it to my dad. So last fall, I buried the three plastic pots in my Kitchen Garden and piled a few leaves over top of the pots. If they did not make it, oh well, I had enjoyed them all summer (and a mighty expensive annual they would be). This spring they were perfect and I gave myself a major pat on the back. And I had to reward myself, and Loblaws once again led me into temptation. This year I purchased another ‘Red Dragon’ (what can I say, I love red) and also ‘Butterfly’ a green and white variegated leaf with a bit of pink spring and fall. This one is not a cut leaf weeper, I was branching out with more of an upright variety. But there was a Japanese Maple that I had lusted after for many a year. The Coral Bark Maple or ‘Sango Kaku’ was so amazing. The leaves have a red edge on them in the spring, red stems as the leaves turn green in the summer, and the most amazing coral bark all winter. 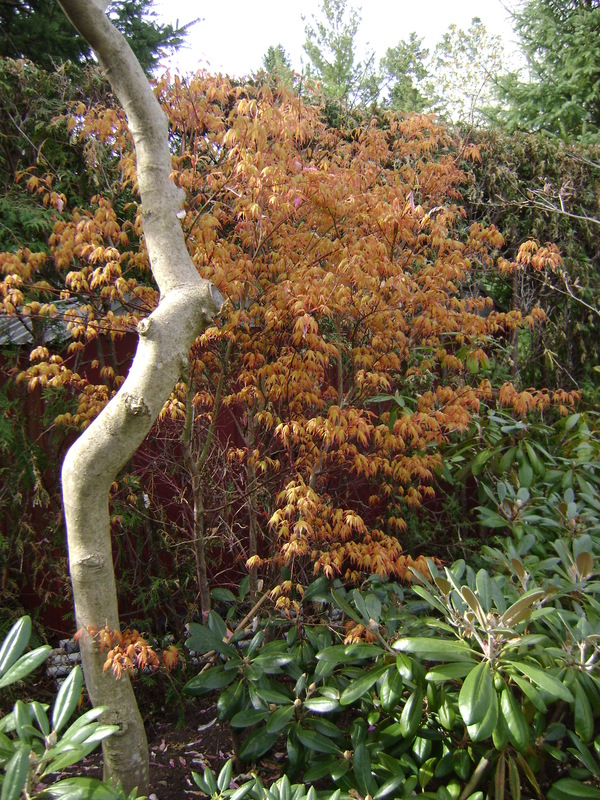 It is also one of the hardier Japanese Maples. When I saw it for sale right around my birthday, I knew it was just meant to be. Not $20, but at only $55 I could not say no. I thought that it would be easier to photograph the leaves, rather than the whole trees, but the colour is not as great as I would like. In the top row, we have ‘Red Dragon’ and then also ‘Red Dragon’, however this one is not as red as the first, maybe not as much sun as it is on the other side of the terrace. In the second row, ‘Butterfly’, can you see the tiny bit of pink on the leaf, then ‘Waterfall, and on the end, ‘Sango Kaku’, now in her summer outfit of plain green leaves, but with a lovely strip of red on the stem. Here you can see (most) of them on our terrace. In a couple of years I will probably plant them directly in the glazed pots and then will have to follow Margaret Roach’s advice and take them into my garage for the winter, but this year I am going to bury all six in the Kitchen Garden. Next year, will the love affair continue?